WHEN I heard the news Tuesday that Judge David Ezra sentenced Eddie Ayau of Hui Malama I Na Kupuna 'O Hawai'i Nei to jail for not disclosing the location of the Forbes Cave items, I could not say that I was happy at the outcome, even though I am a staunch opponent of the Hui and its stand against returning these items. It was a victory for the claimants and other supporters like me, but a very shallow one indeed. 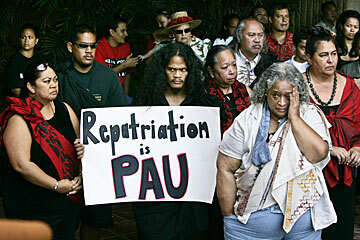 I agree with the Hui that it is a very sad day when we Hawaiians must air our differences in a western court of law, but it was because Hui Malama members took it upon themselves to steal the items through a bogus loan agreement with Bishop Museum, without the consent of the other Hawaiian claimants with whom they were negotiating, that it has come to this. It is all so ironic that the Hui was instrumental in developing the federal Native American Graves Protection and Repatriation Act (NAGPRA) -- adopted in 1990 and which governs the repatriation of indigenous human remains and certain other artifacts -- but is now taking a stand against it because other claimants happen to disagree with the Hui's dogmatic and non-negotiable position. In the same breath that Hui members condemned the western court system, they cried foul that their constitutional rights have been violated. What hypocrisy. BESIDES being saddened by the entire affair, I am also mad because they seem to think that all of our ancestors -- theirs, mine and everybody else's -- support only them and nobody else in this issue. I was appalled to hear someone from the Hui at the court house call out to the kupuna to "descend" from the spirit world and do harm to the "those evil people" who stand against them. I was equally appalled to hear the word hewa, which means offensive, sinful and wicked, directed at the opposing claimants. Their mean-spirited and hateful feelings toward other Hawaiians are totally unwarranted and undignified. Hui Malama members stand outside a federal court room Tuesday where Judge David Ezra presided over a hearing concerning the reburial of Hawaiian bones and artifacts. At the hearing, Hui Malama's leader, Edward Halealoha Ayau, was sentenced to "an indeterminate amount of time" in prison for violating a court order to identify specific locations within Big Island caves where he reburied 83 native Hawaiian artifacts. This is the same uncompromising attitude that has made them so difficult to work with and so disliked by a large part of the Hawaiian community. Unlike many Hui Malama members, I wish no person with whom I disagree any physical or spiritual harm, and I do not think them hewa. I vehemently disagree with some, not all, of their beliefs and methods, but I strongly respect their right to have a different point of view, as I greatly respect other Hawaiians who are willing to step forward and take responsibility for na iwi and other cultural items, even though their beliefs and methods might differ from my own. As they did at the court house, Hui Malama frequently recites the following prayer (which is available on their Web site at http://huimalama.tripod.com): "E homai ka 'ike (grant us knowledge), e homai ka ikaika (grant us strength), e homai ka akamai (grant us intelligence), e homai ka maopopo pono (grant us righteous understanding), e homai ka 'ike papalua (grant us visions and avenues of communication with the other side), e homai ka mana (grant us positive energy). I ask you, where has their "righteous understanding" and "avenues of communications" been in regards to the views of the opposing claimants? Where has their "positive energy" been? IN MOST disputes, including the Forbes Cave case, they have been very closed minded, not understanding and very much unwilling to develop open lines of communications with others who do not agree with them, not just non-Hawaiians, but Hawaiians as well. While they state that all Hawaiians have a kuleana (responsibility) to care for our kupuna (ancestors) in order for our lives to be "pono," and that they will "defer to wishes of identified lineal descendants and the 'ohana (family)," time after time after time they have insulted those who have come forward as being "ignorant," "un-Hawaiian" and "un-spiritual." Gee, let me see, where have we heard these epithets before? Furthermore, Ayau writes in an essay titled, "Rooted in Native Soil" (which is also on their Web site), that they expect to be treated as "partners, as natives, as human beings," and that others should "follow the NAGPRA law" as they do. With the Forbes Cave case, they have chosen to do precisely the opposite; they totally disregard NAGPRA and the negotiation process it mandates, which they themselves helped to develop, by taking the objects without the authority of the Burial Council and the other claimants, stating that they have been given this authority, exclusively, by the kupuna. Ayau also states that "in sharing aloha or going to war, we maintain a balanced perspective." Yeah right. The only perspective they will accept is their own. Period. End of story. I APPLAUD Hui Malama members for their ability to rally their troops, which out-numbered the claimants and other supporters like me at the court house. But this is not a true indication of the depth of their opposition. Typically, other claimants do not belong to a large hui of people with group e-mail lists and years of savvy media experience. Instead, they are mostly individual families or very small groups who have heard Hui Malama's call and are willing, for the first time, to take responsibility for the iwi in their ancestral geographic area or of their direct bloodline. Hui Malama is not, I repeat, is not the one and only "true" voice in this debate. Time after time during the last 15 years, members of Hui Malama have put down, bullied and even cursed many of these sincere and humble people, even as they preach the party line that they encourage all Hawaiians to get involved in the repatriation process. Many Hawaiians have been deeply wounded by the Hui's lack of respect for other beliefs and protocols which, historically, are varied by family and district differences. Like many of our cultural practices, there is often more than one way of doing things. I am tired of hearing Hui members lie to the public when they say that all opposing parties want to destroy the iwi or keep them in museums, which is so far from the truth as to be ridiculous. It appears that they will never acknowledge the fact that many of us want the same thing as they do, which is to return the iwi to their original burial sites, or as close to that as possible, with our differences being mostly about cultural and religious protocols associated with such reburials, and whether non-burial items should be reburied. In 1993, I quit my appointed position as an inaugural member of the Island of O'ahu Burial Council because of the blatant disregard and disrespect that Hui members showed myself and others on the council. Since then I have talked with many sitting and former council members, and others who have had dealings with them, who have told me they have experienced the very same thing. TO THE members of Hui Malama, Eddie Ayau has now become a martyr of heroic proportions. I hope that the rest of the Hawaiian community will not be swayed by this and will take the time to listen carefully to other points of view, of which there are many. Hui Malama is not, I repeat, is not the one and only "true" voice in this debate, supported by all of our ancestors, our 'aumakua, our gods, and the majority of the Hawaiian community, as it so fervently declares. Up to now, those of us in opposition to the Hui have not been able to counter their underhanded tactics and vicious public and private attacks. I'm grateful to the groups and individuals who had the courage to stand up to them at the risk of being cursed and dammed as the villains. I am also thankful that the courts have seen through the Hui's bombastic rhetoric to allow others to be heard. I hope that this sets a clear precedence for all future negotiations. It shall no longer be the Hui Malama way or the highway. Nanette Naioma Napoleon, a writer and researcher, is director of the Hawaii Cemetery Research Project, an effort to catalogue information from headstones in Oahu cemeteries.